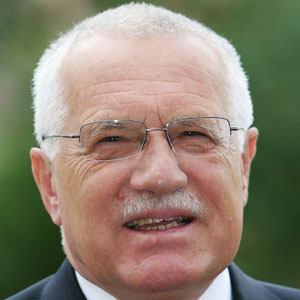 Politician who held office from 1993 until 1998 as Prime Minister of the Czech Republic. A founder of the Czech Civic Democratic Party, he also served from 2003 to 2013 as President of the Czech Republic. After graduating from the University of Economics, Prague and subsequently taking classes at several Italian and American universities, he worked for a time for the Czechoslovak State Bank. He resigned from his office as Prime Minister as a result of critique of his fiscal policy. His marriage to Slovak economist Livia Klausova resulted in two children. He succeeded Vaclav Havel as President of the Czech Republic.